Thank you for your interest in the We are Resistance: National Call on Black and Asian Solidarity. Thank you to our co-host Alicia Garza, Black Lives Matter and our speakers Patrisse Marie Cullors-Brignac, Black Lives Matter; Scot Nakagawa, ChangeLab; Kabzuag Vaj, Southeast Asian Freedom Network and Freedom Inc.; Fahd Ahmed, DRUM – South Asian Organizing Center. Already, this call and this movement has sparked more conversations and actions across the country! As you all listen to the call, we wanted to share a couple reflections. This growing movement has inspired and opened up space for new people to take action in support of Black liberation as central to our collective liberation. This is also historical. 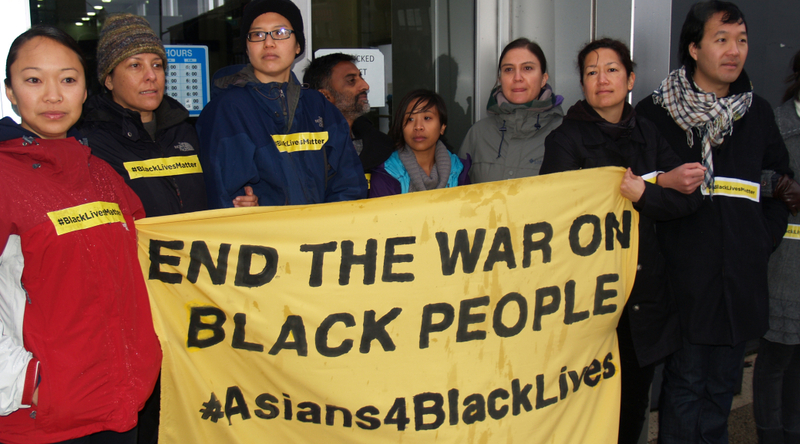 The Asian American movement and many of our grassroots organization were inspired by the Black liberation movement and do Black and Asian solidarity in our day-to-day work. This is also an opportunity for us to examine how we show up for people who are invisibilized in our own community. As DRUM put out in their Questions to the Movement,“As we acknowledge black communities as a whole bearing the brunt of state violence, what members of our communities do we invisibilize due to multiple systems of oppression in our societies?” As Asian folks, we must ask ourselves: How do we show up for women, the poor, queer and transgendered folks? How do we show up for Arab and Muslim community and Southeast Asian communities who are primary targets of police and state violence in our own community? How do we show up and take the lead from folks in our own community? Showing up for Black Lives must also mean showing up for our own community. ORGANIZE, ORGANIZE, ORGANIZE: Hold conversations and discussions at about anti-Black racism in your school, community and with your friends and family. SHOW UP and TAKE ACTION: It is important for Asian American communities to show up for Black Lives and take the lead from Black communities. This also means engaging, reaching out and taking initiative. Stay up to date with Ferguson Action. As mentioned above, we should also use this moment to talk about how to show up for folks marginalized in our own community, especially the Arab and Muslim community and Southeast Asian communities who are primary targets of police and state violence in our own community.